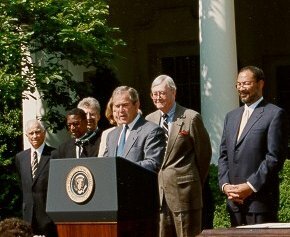 On May 2, 2001 President Bush announced establishment of a bipartisan, 16-member Commission "to study and report … specific recommendations to preserve Social Security for seniors while building wealth for younger Americans." Modernization must not change Social Security benefits for retirees or near-retirees. The entire Social Security surplus must be dedicated only to Social Security. Social Security payroll taxes must not be increased. The government must not invest Social Security funds in the stock market. Modernization must preserve Social Security`s disability and survivors insurance programs. Modernization must include individually controlled, voluntary personal retirement accounts, which will augment Social Security. Public hearings began on June 11. An interim report, describing the challenges facing the Social Security system, was issued, followed by a final report with specific reform recommendations.